Another quality instrument manufactured by us is Suction Machine that is made using the best grade stainless and mild steel. This machine is further, electrostatic powder coated thus, giving low noise operations. The machine is made available with a reusable filter that increases the working life of it to a great extent. 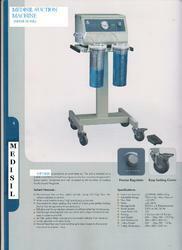 Our offered range is in tandem with industry standards and thus, widely availed by many medical centers.